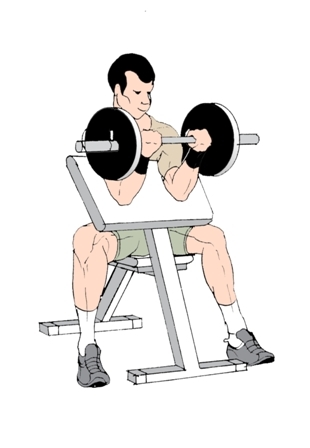 Whys is preacher curls such an effective exercise? Preacher curls is the best exercise to build long peaked biceps and reduce the space in the elbow region. 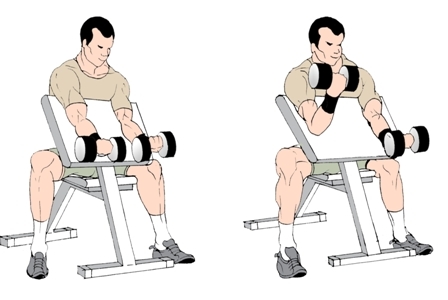 You can use barbells, dumbbells or even pulley/lever machines to do preacher curls. Also check how to do cable curl with preacher bench & reverse preacher bench curl. 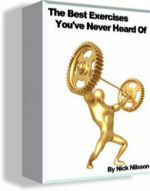 Many Weight Trainers complain that they have a large space between their biceps and elbow joint. This asks for a longer biceps or more appropriately the brachialis muscle. Although the shape of the biceps is hereditary and the biceps can have a long tendon or long muscle belly, you can get a fullness in this crucial area giving your arms a complete look. If you have a long tendon then preacher curls is the best exercise to build a longer biceps lower end and get a full biceps pump. Another advantage of the preacher curl is that it immobilizes the shoulder joint and help in isolating the biceps and brachialis muscles more effectively. Purpose - To Build the lower end of biceps and develop a biceps peak. 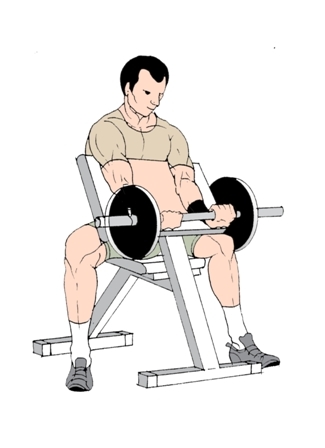 This exercise is done on seated a Preacher Bench with a Barbell or E-Z curl Bar. I prefer the E-Z bar. Get seated on Preacher Bench with your chest against the support and grab hold of the bar placed in the preacher bench rack in front of you. Curl the bar as in standard barbell curl and get maximum contraction at the top. Perform the negative - the lowering of the bar slowly feeling constant stress throughout the movement and lower the bar to get maximum extension. You can do them two arms or in an alternating manner. Cable provides a constant tension throughout the exercise and is an excellent alternative to Preacher Barbell curls. An excellent exercise to build biceps and outer side of forearms. This exercise is done with an overhand grip and done just like Reverse Curls. As we have seen earlier, preacher curls minimize the shoulder muscles involvement and hence better isolation exercise that regular barbell curls. However they ignore one important fact about biceps muscles: A prestretched biceps muscle contracts harder and preacher curls prevent this from happening. Also experts suggest that a straight angle rather than inclined one is preferable while doing preacher curls as the former can be hard on your elbows. Nevertheless add preacher curls to other effective exercises like inclined biceps curls, cable curls and you will never be bored again.